Kyle was under the impression that everything on Champs-Élysées would be closed for the holiday. Boy was he wrong… Not only was everything open, the entire road was packed. 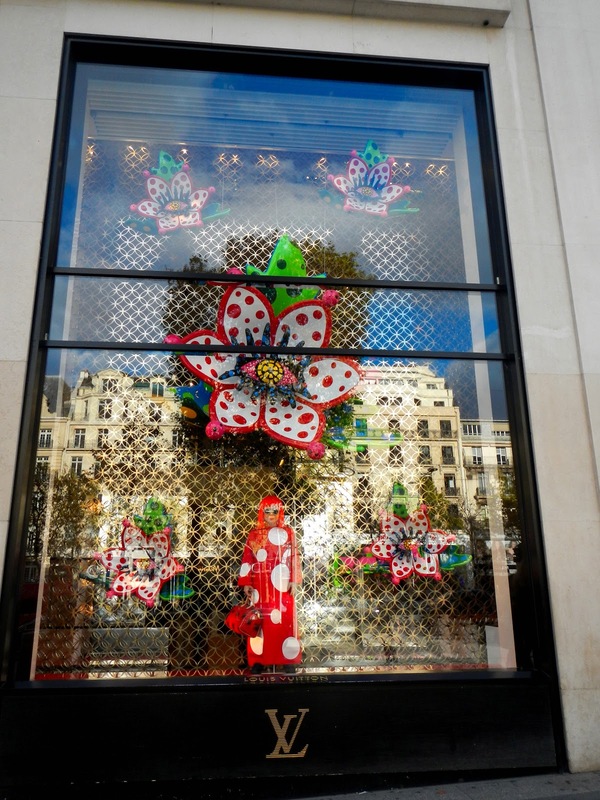 I took a few more window-display snapshots… including ones of the Louis Vuitton displays. 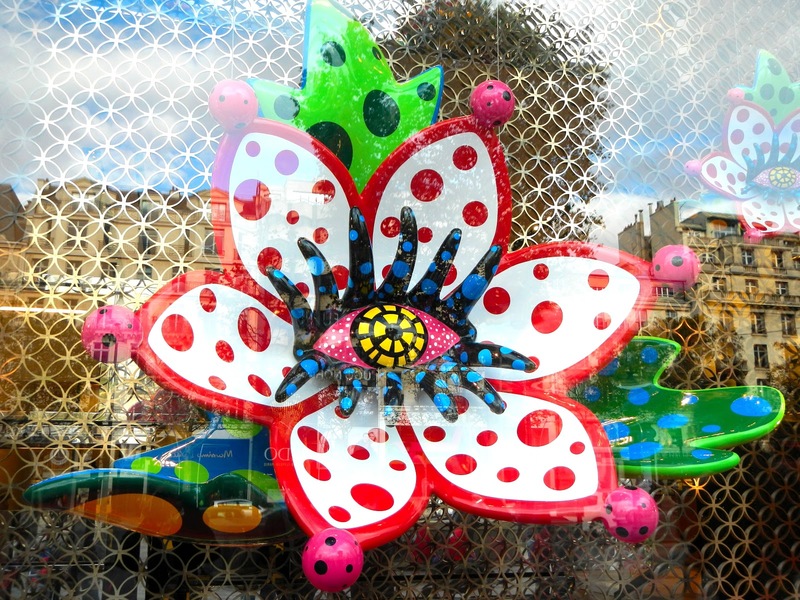 I’m pretty sure I’m going to try to recreate the image of that flower-eye and put it in my set for my show somehow… Once it started to rain, Sheila and I went back down into the metro and went over to the Hôtel de Ville stop since I wanted to stop by BGV (a big department store) because they were having a big sale. In reality, I wanted to go there to take pictures of all of the mannequins. As we were going through all of the different levels, I noticed a large art section. On a whim (sort of), Sheila and I looked through it to see if they had a specific size of designer’s graphing paper I could use for the set design portion of my final project for Mme. Hersant’s class. Much to my surprise, they did! I bought that, along with a few sketching pencils, an eraser, and some colored pencils so I could work on that part of my project as time went on. Sheila was getting tired, so we went home to rest and relax. We stopped by Monoprix on the way home to pick up a bottle of wine, and Sheila got a snack. We Skyped Kyle while we had our snack (the French version of flan, which is more like a custard pie), and decided that we’d have him come over to drink with us after we had our respective dinners later that night. Since Carrefour would be closing early for the holiday, I ran out and bought the necessary supplies to make our usual white-wine based cocktail. Sheila and I had some gluten free pasta, our favorite avocado-tomato-mozzarella salad, and some hot dogs (I swear, that’s what Madame calls “sausage”) for dinner. The cheap bottle of wine we bought was absolutely awful. I couldn’t even finish my small glass of it. Kyle’s host family had dinner a little later than usual, so he joined us around 10. We had a quiet, laid-back night of King’s Cup, playing some French music on Deezer, and a whole bunch of new inside jokes. Sheila and I got up around 11 on Friday, even though we supposedly were supposed to go with Kyle to Sweet Briar to see if his tickets for a sports event he was going to see came in the mail around that time. We had brunch, and got online to see if he’d managed to get his tickets. They hadn’t come yet, which was worrisome since the game was tomorrow. Sheila and I got ready, then met up with Kyle to go to the stadium itself to see if he could explain that he’d bought the ticket (he had all of the confirmation printouts), but it never came in the mail, and get them to print it out for him. It took a while for us to get there on the metro, but we did it, and Kyle got his ticket. We ended up going to MacDo again for a very late lunch/snack, and because I didn’t want a burger/didn’t want to deal with the whole sans pain situation again, I only ordered some fries and a drink from the bornes (electronic ordering system). We went back to our place with the intention of napping, but we ended up watching a whole bunch of YouTube videos instead. Kyle headed back to his place to actually nap before dinner, so Sheila and I napped after he left. We thought we’d all be staying in tonight again since none of our friends seemed to want to go out (nor did we), so we had our usual dinner, and settled into relaxing for the night. Campus Movie Fest had just happened back at my home college, so I was watching all of the movies that were submitted. To our surprise, Kyle was coming over again. His host family had gotten into a bit of an argument, and the tension was a bit much for him to handle, so he wanted to escape. We spent the better part of our night watching all of the CMF movies from this year, and the better ones from years past, including the two movies I had submitted. Kyle has made a bit of an acting debut for the computer screen as well, so we watched the movie he was in. I definitely have a few pretty good ideas bouncing around in my head for next year’s competition. Considering what I saw for this year’s set of movies… I really need to bring it. Kyle ended up heading home around two, so now we’re off to bed. Here’s my favorite movie from this year’s CMF at my college. It won Best Drama. This is the movie I submitted last year. This is the movie I submitted my freshman year. Here’s the movie that Kyle was in as a freshman. This entry was posted in champs-élysées, Corneille, France, french, MacDo, movie. Bookmark the permalink.